Taken from Hooked on Noro: Tote your iPad or other tablet device around in style with the beautiful Devine Device Cover and prepare to rake in the compliments! 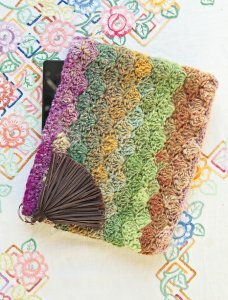 This pattern is from Hooked on Noro, pg 30 - Devine Device Cover. Size US 4mm crochet hook (or size needed to obtain gauge), fabric for lining to measure the size of your cover plus a little extra for seam allowance, 2 large press studs/snap fasteners, and a leather tassel (optional) are required but not included. Finished Measurements: Customizable to the size of your device.